Since the start of this year, I have been having major problems with my nails. They have become brittle. Hence, they easily break. I can barely grow them to a decent length. It all started a week before my sister's wedding last January. I broke 3 nails and I had to file all my nails to its shortest. Unfortunately, I am not gifted with naturally long nails. I have to grow my free edge a few millimeters for my nails to appear "decent". Otherwise, they would look like they belong to a child. Seriously. An important occasion such as that made me feel very uneasy to have such short nails. So I decided to get acrylic nails done, just so I can paint some nail design for the wedding. As I am not used to wearing acrylic nails, I personally removed them a few days after. Sadly, I didn't have the proper knowledge on how to remove them without damaging my real nails. And so, in the process, I sort of forced the acrylic off. This entailed major scraping and filing. Consequently, the abuse damaged my natural nails by making it weak and brittle. A few more important events made me decide to try other acrylic services of various nail salons in the metro. I was apparently being impatient with nurturing my fragile nails. But 3 months ago, I decided to put my foot down and was determined to rescue my natural nails and restore them to its former glory. I bought several nail strengthening base coats in my rescue attempt. Among all the products that I tried, only one gave me satisfactory results. 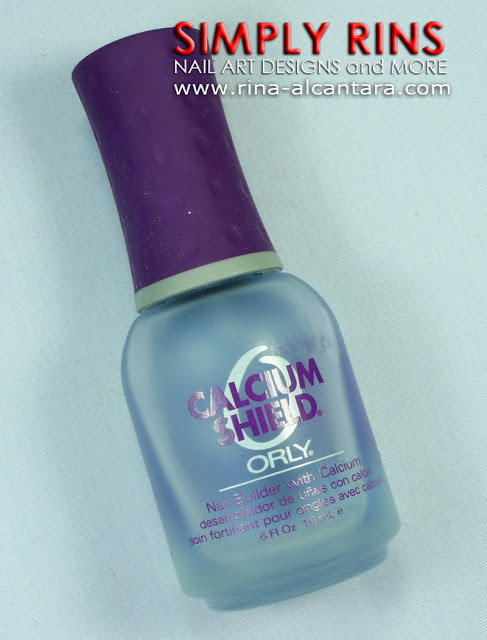 The Orly Calcium Shield have been my nails' best friend since I purchased it last May. I was able to grow out my damaged nails with minimal breakage and a month later, I was able to grow my nails to a decent length. My regimen is to apply it at least 3 times a week until I've eliminated the damaged portion of my nails. When my natural nails settled, I continued using Orly Calcium Shield as base coat before painting my nails. I have fallen in love with this product and will probably continue using it even after consuming an entire bottle. I should not be pressured to always have art on my nail just because people expects me to have one all the time. Nail artists are allowed to wear their nails naked. Sculptured nails are a quick fix to have decent nails almost instantly but not an option to have if you have damaged nails. Too much friction is bad for natural nails. Patience is a virtue. Breaks will happen but nails will grow back. Deal with the anxiety and learn how to wait. Find the product that works for you. Be prepared to be disappointed along the way. Have you experienced brittle nails? How did you rescue them and what products/regimen worked? I'm glad you found something that worked for you! I like Orly Nail Defense and Nailtrition; my main issue is peeling, not brittleness. I think Instant Artificials base has helped keep my nails from tearing at the free edge like they used to do pretty regularly. nailtek II makes my nails rock solid, so i stick to that. glad to hear your nails are doing better! Hi, KarenD! Oh, I haven't tried Orly Nail Defense and Nailtrition. I'll try to look for that on my next shopping day. Hi, nail crazy! Yay, I didn't realize a polish remover can damage nails. I have to look into that. Thanks for the info! Orly is available in PCX or Personal Exchange, Landmark, and Pure Beauty. Orly Calcium Shield is the best stuff I've ever used. I ended up having to move overseas, and I haven't seen it for sale here. When I ran out, I just used whatever had calcium written on it. None of it was any good. I went back to the US for a visit and bought some highly recommended OPI Original Nail Envy. It was absolutely awful to my nails. I finally ordered some Orly CS from HD Beauty Supply....3 bottles. I've only applied it twice and my nails already look like I had a french manicure. This stuff is amazing!!! In the past several years of using it, occasionally a nail will break clean off because they are so hard, but it's usually just one nail every so often. I also love the way it just peels off, even though I'm sure that's not great for my nails.